The second Sons of Perdition album, "Psalms for the Spiritually Dead", will be officially released today, Sunday, October 31, to coincide with Samhain. "Psalms" is the spiritual brother of the first album (albeit inverted), "The Kingdom is on Fire". It was released on Easter Sunday a few years back. Anyways, "Psalms" is a miserable effort and I hope you lose some sleep over it. God knows I have. 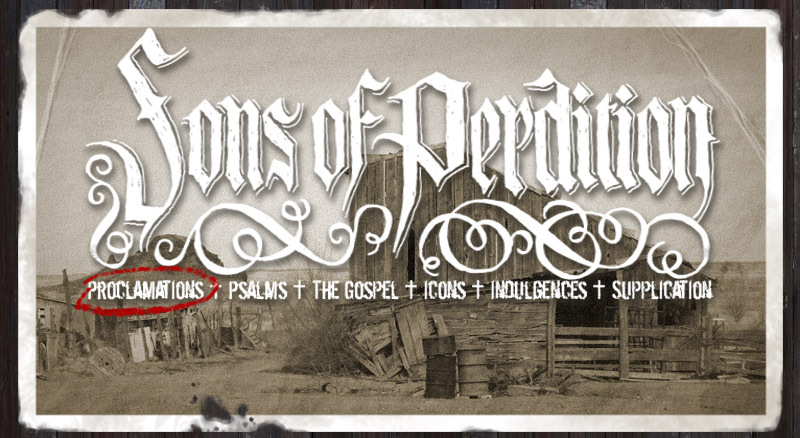 The album has been available for members of SonsOfPerdition.com for awhile now, but it will now be available on iTunes and all those other sites. You can still get it cheaper from me, and it'll include lyrics and photos. Don't feel guilty about buying it elsewhere, though. You're supporting the hell out of me either way. Because I'm not one to be stingy with the misery, I also made a video for "Psalm of Slumber", the final track from the new album. It's the first official Sons of Perdition music video, although some inexplicably kind souls have made their own videos in the past. I hope it isn't the last one I make. I pieced it together using video from the Prelinger Archives. It's a document of despair. You've been warned. You can view the video on YouTube by clicking here .